Nicole's Needlework: Sea to Shining Sea Finished!! I got the final thread pack from Amy on Saturday and I was determined to finish it up yesterday! 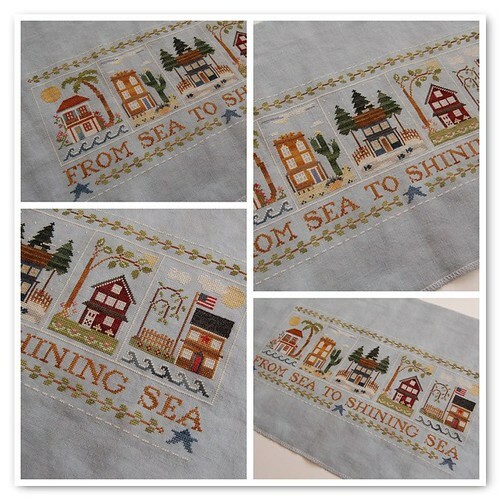 Little House Needleworks "Sea to Shining Sea"
I had so much fun stitching this one. I really looked forward to every thread pack and the different silk colors. The only thing I changed was on Southwest. I used Icing for the windows and clouds instead of the gray. It was a little too dull for me. Today I'm going to be working on Kind Fond Love Sampler. I hope to get either some of the words stitched or some trees. :) Write later! GORGEOUS!!!!!!!!!!!!!!!! Makes me want to go get that fabric & the thread packs & get started!!!!!! Congrats!!! WOW!!! It really turned out fabulous!!! I haven't even started but have all the thread packs except the last one is still at my LNS to pick up! You didn't waste any time! I love it!!! looks awesome! I am still working on the first house! LOL Once i am done with exchanges i will be doing more ME stitching and trying to finish up ALOT of my WIP's. I hope. Congrats on a great finish!!!! Looks awesome. I am only on the 3rd part. You are such a fast stitcher. You amaze me. Finished one section in one day. Woo Hoo. what a great finish! you did such a lovely job on it! Gorgeous!!! Congrats for the wonderful finish! I love it! A beautiful finish Nicole! Congrats! I love it Nicole! You did a great job!!! Fabulous Nicole! I really do love this piece now that I've seen yours all stitched up! Nicole, its gorgeous. My last thread pack came today, and I can say that I finally finished that blasted border which seemed never ending. Yours is so pretty and I'm thinking to copy your change on the Southwest part, if you don't mind. That looks great! Nice finish. wow That is just literally awesome!! I don't even have any houses on mine since I ended up doing this BB design for my friend but I have gotten them all from Amy to do! Yours just turned out beautifully and you inspire me!! I bet you love it too!! It's just lovely. Beautiful work. I love the fabric that you stitched this on. It is beautiful!! Congratulations on your finish. I have enjoyed watching your progress on this. I love it. I will have to use the same color fabric. What a great choice. That is really lovely, Nicole. Congratulations on your finish! It looks great, Nicole. You must be so pleased to get it finished after waiting for each part to arrive? Well done! Wow, you stitched that last part up fast! It looks fabulous, congratulations! Very Beautiful Nicole! The fabric colour matches so well with this design! Your piece is fabulous! I've been eyeing this design online and seeing it finished may have just pushed me over the edge to buying! congratulations. woohoo!!! what a beautiful piece. I just got the 1st thread pack last week, about to start stitching tonight on this one! This is absolutely beautiful!!!!!! Congrats on your wonderful finish!! You did a lovely job! Congrats on your wonderful finish!! You have an Award - please visit my blog! It is gorgeous Nicole! Happy Dance! Very Very nice. You inspire me. Do you have a special place to stitch? It is a beautiful finish!! Wil you please post it to the Fallen in love LHN/CCN blog? That is truly a gorgeous piece!!! Wonderful work! Sea to Shining Sea is gorgeous!! I have mine kitted and ready to go and now you're really making me want to start it. LO! What a gorgeous finish! Congratulations! Have you picked which house is your favorite?